In my Response Oriented Selling sales training seminars, I sometimes come across truly extraordinary salespeople, or "hunters". Invariably, amazing success stories emerge from them once they learn my techniquess--many doubling their sales overnight. Of course, my clients always wish they had more of this type of person on their staff. We've found that this so-called "x-factor" has proven exponentially more important with regard to sales managers, too. Since back when I was an ad director with 20 ad reps, I've wondered exactly what's behind this x-factor and can it be quantified? Can it be leveraged to build great sales teams? Last year, I worked with a newspaper who had a staff full of these hunters and claimed they found a process to clearly identify the factors that make the difference. They had been working with a guy named Tony Traven with Culture Index who had developed a process to identify which of the people they were considering for an interview were these hunters, and even which of those would specifically succeed with the Response Oriented Selling techniques. I was skeptical, but given the impressive ad staff my newspaper client had, I gave Tony a call. To prove that his techniques worked, he first offered to do a profile of me (and it turns out I'm a hunter, too). He gave me all sorts of insight about myself, how I could capitalize on my strengths to boost my productivity, what responsibilities I shouldn't be handling, and even how to recognize which newspapers who call me would do best using my techniques. I was amazed at how much he helped me in so little time. 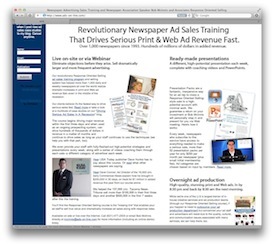 He also offered--and this is where you and your staff come in--a complimentary analysis and feedback directly to any client newspaper or sales organization, even if they've never worked with me. In addition, he predicted he could clearly delineate between hunters and farmers and show you a better way to identify, manage and develop top-tier talent. If you would like feedback on how to leverage your strengths to your advantage please click on the link below. Total time commitment 10 minutes. You've got nothing to lose and I think you'll be impressed. If you need more information email me at mcinnis@ads-on-line.com or give me a call (631) 647-0445.